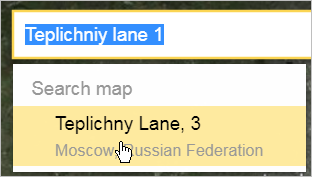 Enter your search term (map item name) in the bar. Enter the coordinates as a decimal number. For example, 55.777044. The number of digits after the decimal point can not be more than seven (this level of accuracy positions the marker within 1 cm of the actual location). Coordinates can be entered in any order — “latitude, longitude” or “longitude, latitude”. Two responses to your search term (“lat-long” and “long-lat”) will display for every record. Options that correspond to “north latitude, east longitude” values are offered by default. To change one of the hemisphere selections, add a “minus” (hyphen) in front of the appropriate coordinate. 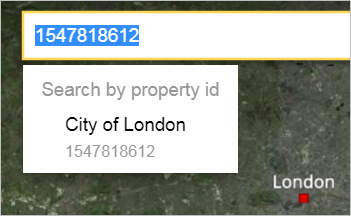 Coordinates of places display on Yandex Map Editor. 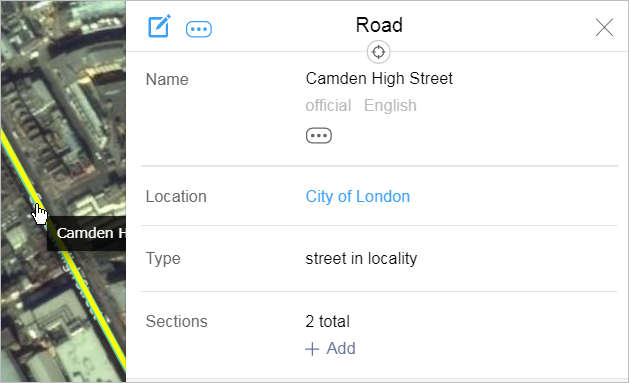 Every Yandex Map Editor item has a unique numeric ID that can be used to search for it on the map or send information about it. To find out an item's ID, select it on the map. Incorrect search terms are corrected automatically based on available data, or a message will appear stating that the “item was not found”.